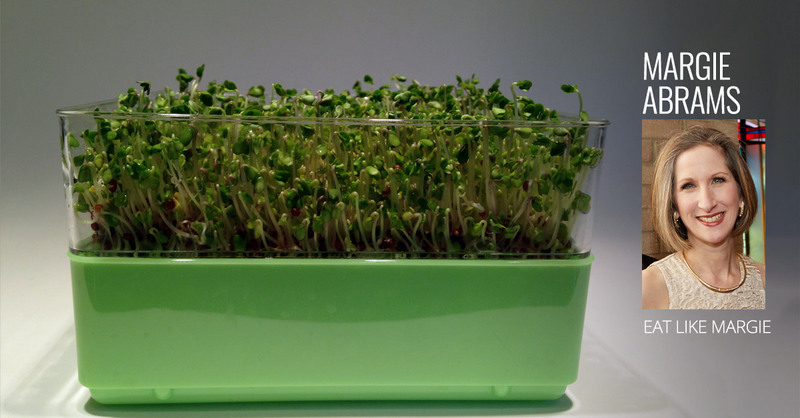 My interest in broccoli sprouts was first piqued several years ago when they turned up in a superfoods article we published—because of their antioxidant punch and even more cancer-fighting substances than broccoli itself! 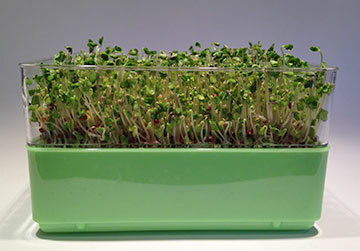 But while I’ve always enjoyed fresh sprouts (all kinds, actually—bean sprouts, pea shoots) I stopped buying them due to all of food poisoning outbreaks they have caused. Well, this year, I decided to try growing them myself. 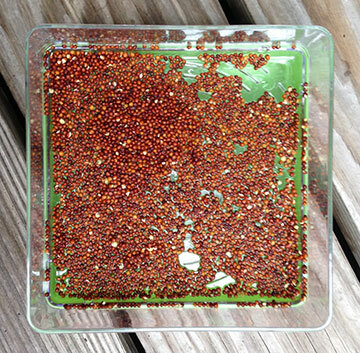 I bought broccoli seeds (about $20) and a two-tiered seed sprouter (about $13) online. The rest is culinary history. Growing them could not be easier—just follow package instructions. You start by soaking them for several hours (I did it overnight)…and then rinse the sprouts and base twice a day to prevent mold from growing. They really do grow as fast as the package says they will, as you can see from my day-by-day photographs. Day 1: Into the sprouter. 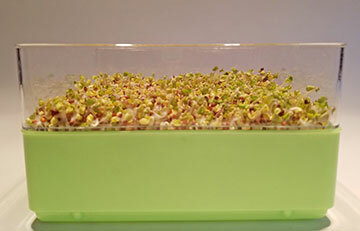 Some seeds are already germinating from the overnight soak! Day 2: Now a lot of seeds are germinating. Plenty of little squiggly roots plus leaves starting to unfold. Day 3: It looks like a chia pet! Day 4+: A miniature forest, and they are already ready for eating. As the days go by, I’ll take out a section to eat and leave the rest on the counter to keep growing, continuing to rinse twice a day. For my first “crop,” I rotated which tray was on top. For subsequent crops, I grew just one tier at a time—realizing that I didn’t necessarily want to add sprouts to everything I ate. 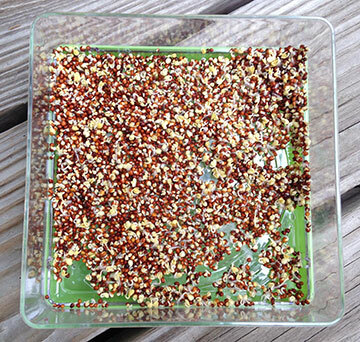 Another idea is to stagger when you start the seeds so that you don’t have too much ready at once. Added to my smoothie one morning. 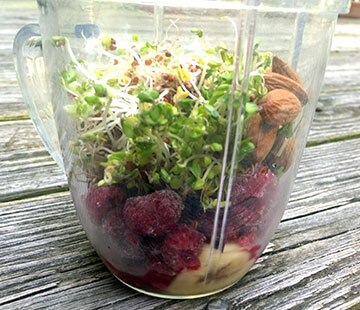 I blended half a banana, some frozen raspberries, raw almonds and sprouts with almond milk. Not yummy like an all-fruit smoothie, but refreshing after I added a splash of maple syrup (a bit too “green-tasting without the maple syrup, I confess). 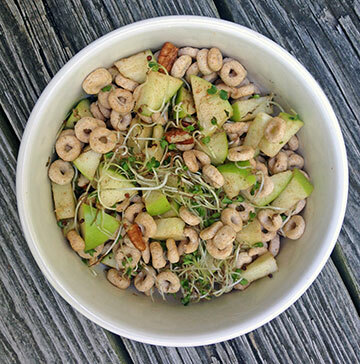 Sprouts have graced a few different salads. One day, we had leftovers of the chopped salad my husband made. 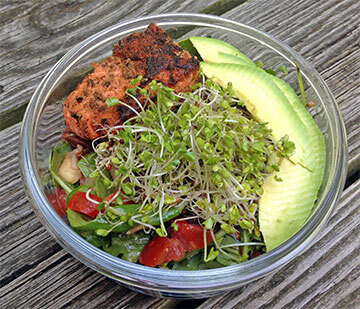 I topped it with broiled salmon, sliced avocado and sprouts for lunch. Another day, I made a Tuna Slaw. 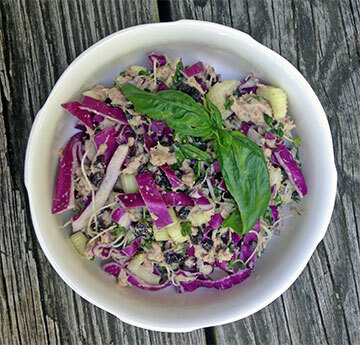 Ingredients: Canned tuna, red cabbage (sliced thin), celery, dried currants, onion powder, ground fennel seed, fresh basil (mine was home grown! ), salt, pepper, veggie mayo. Just mix everything together in a bowl. 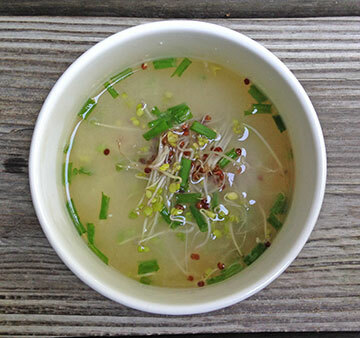 Sprouts wilt when you add to hot soup and become noodle-like. Here, I added them to Miso Soup. I used chickpea miso paste for the broth, cut firm tofu into tiny cubes and added a splash of gluten-free soy sauce and snipped fresh chives (also home grown).